tl;dr Hopsworks is a data platform that integrates popular platforms for data processing such as Apache Spark, TensorFlow, Hops Hadoop, Kafka, and many others. All services provided by Hopsworks can be accessed using either a REST API or a User Interface. But the real value add of Hopsworks is that it makes Big Data and AI frameworks easier to use by introducing new concepts for collaborative data science (Projects, Users, and Datasets) and ubiquitous support for TLS certificates, opening the platform for integration with the outside world (IoT/mobile devices and external applications). Hopsworks makes the most popular data parallel processing platforms easy to use via a UI and REST API. Hopsworks is a data platform that includes the most popular and scalable data storage and processing systems in the Hadoop ecosystem and beyond. In Hopsworks, all services are exposed via a single REST API and security is managed, end-to-end, using TLS certificates and new abstractions required for multi-tenancy, based on Projects. For humans, Hopsworks is accessed via a user interface and allows users to access data, services, and code through a new project abstraction. A project is a sandbox containing datasets, other users, and code. Users familiar with GitHub will recognize a project as the equivalent of a GitHub repository – users manage membership of the project themselves and also what code and data should be in the project. In a project, a user can have the role of “Data Owner” (the administrator) or a “Data Scientist”. Data Scientists are restricted to only uploading programs, running programs, and visualizing results. Data Scientists are not allowed change membership of the project or import/export data from the project. This enables Data Owners to manage the analysis of sensitive datasets within the confines of a project by inviting a Data Scientist into the project to carry out the analysis within the project. In the background, for each project that a user is a member of, we will construct a new Hadoop identity and create a new TLS certificate for the “project-specific user” (or projectUser, for short). Users manage membership of projects themselves. A “Data Owner” can add a “Data Scientist” to a Project. Some datasets will need to be made in available in more than one project. Rather than storing a copy of the dataset in more than one project, which is both expensive and error-prone, a data owner can share a dataset from her project with another project, making it available in that project with either read-only or read-write privileges. Datasets can also be made public within an organization, so users can add them to their projects in a self-service manner. The Data Owner of the “Raw” Project is sharing a dataset with the “Derived” Project. In the Hopsworks UI, sharing a dataset is like Dropbox. Right-click on the folder to share it. An important and unique feature of Hopsworks (unique among Hadoop platforms, in any case) is that each project can have its own conda environment on all hosts in the cluster. If a Data Owner enables conda for her project, a conda environment for that project is provisioned on every host in the Hops cluster. The user can then install the libraries and versions of the libraries that she wants just for her Project. Pyspark and TensorFlow jobs run in that project will run in the project’s conda environment on every host in the cluster. The conda environment can be initialized with the desired version of python, such as 2.7 or 3.6. There is only one conda environment supported per project. A user can search for python libraries on either conda channels or with pip, and then install the desired library/version on all hosts in the cluster (for just her project’s environment). Hops supports GPUs-as-a-Resource, and Hopsworks allows users to start a job asking for GPUs for executors. YARN node labels can be used when there are different types of GPU servers. 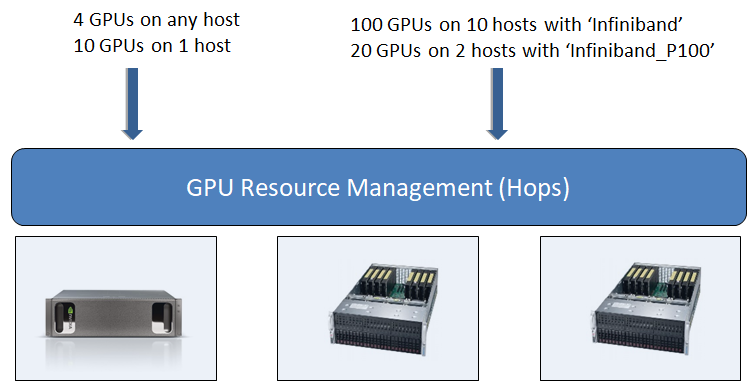 As Hops manages GPUs-as-a-Resource, from within Hopsworks, we can start tensorflow applications with 10s or even hundreds of GPUs. Hopsworks supports APIs for massive parallel experimentation (such as hyperparameter optimization) via the Hops Python API. 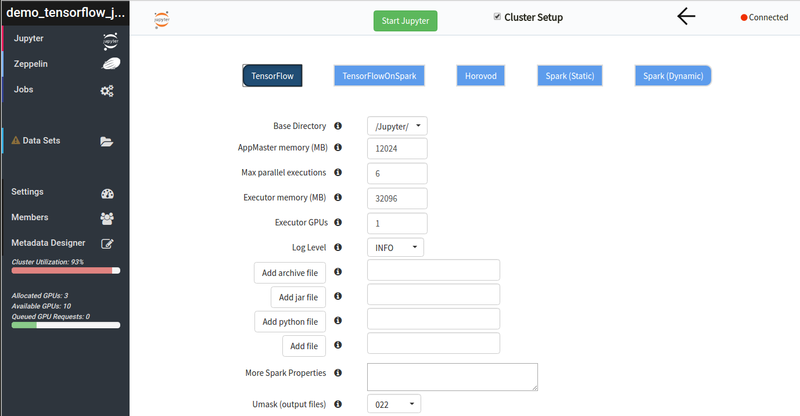 As Hopsworks supports distributed TensorFlow (including Horovod and TensorFlowOnSpark), we make it easier to use by running TensorFlow applications from within PySpark applications. The Tensorboard UI can be viewed for every TensorFlow application. Results from hyperparameter optimization runs are also aggregated into a single Tensorboard to easily discover the best hyperparameters for that experiment. Hops Python and Java/Scala APIs make it easier to securely use services. I this example, we can replace tens of lines of boilerplate code for setting up a Properties file for Kafka with a single API call to Hopsworks. Now you don’t need to choose between Spark Streaming and Flink when you decide on a data platform. Hopsworks supports both Flink and Spark Streaming, through YARN. We also support Kafka-as-a-Service. Kafka topics (used as channels for producing/consuming messages) are private to projects. Users can create a topic with just a few clicks. Topics can also be shared with other projects enabling real-time communication between projects. Hopsworks also provides an Avro schema registry for Kafka topics that is accessible via Hopsworks’ REST API. Hopsworks has REST/UI support for creating/deleting/managing Kafka topics and their Avro Schemas. An example of how to manage a streaming application with Hopsworks is shown below. Data arrives at a Kafka topic as a stream (the external applications uses a certificate downloaded from Hopsworks to securely communicate with the topic and to authenticate itself). The Engineering project, process the stream and filter/enrich the data before it is forwarded to different Kafka topics for different projects, as well as sent to a sink, such as Apache Hive for offline analysis. 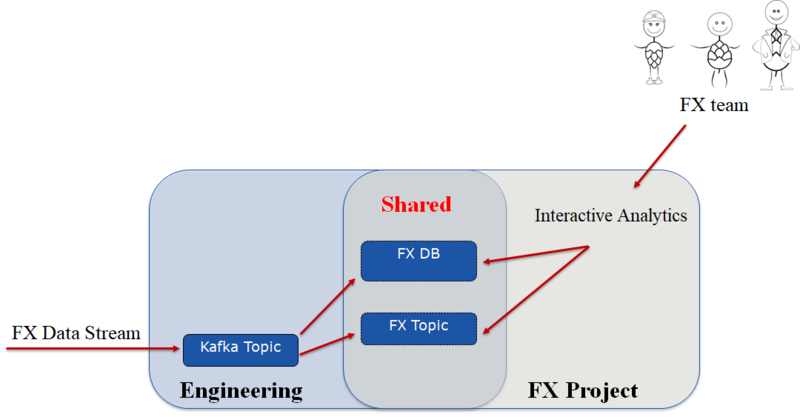 The FX team below can then process the stream arriving at their FX topic without further help from IT, and manage access to that data themselves. Teams manage their own historical data (in Hive, SparkSQL) as well as streaming data (in Kafka topics). Hopsworks provides UI and REST support for running Jobs. A job could be a Spark application or a Spark workflow, a TensorFlow application (parallel experimentation or distributed training), or a Flink application. Jobs can be scheduled for periodic execution or run on-demand. 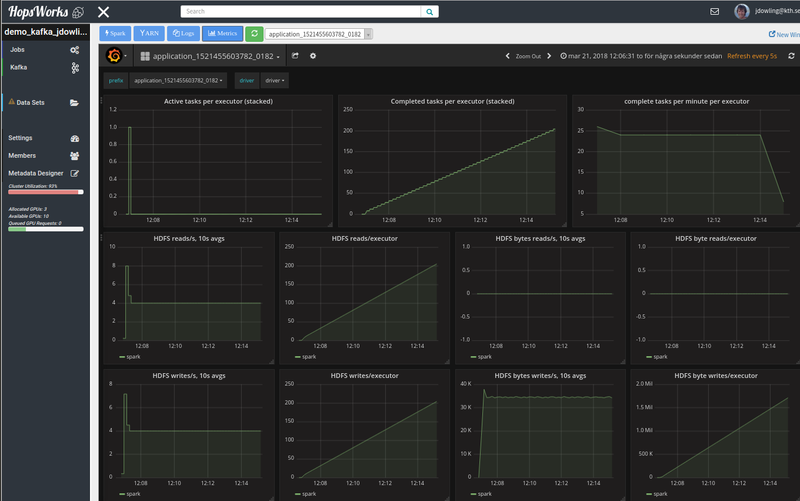 Spark Jobs are monitored using a Grafana UI that provides information about Spark, HDFS, and YARN resource consumption. Spark and TensorFlow Job logs can be accessed either in real-time via a Kibana UI. All jobs (Spark, TensorFlow, Flink) have their logs aggregated by YARN and they can be read after the job completes from a “Logs” dataset in the project. Jobs can be scheduled or run from a Jobs UI that also provides access to job logs and the Spark History Server UI, Kibana Logs for the Job, and Grafana logs for the Job. The Jobs UI is used to run workflows. Hopsworks provides a REST API for composing a workflow of Spark Jobs together. The workflow can then be run as a single Spark Job. Spark Jobs can use log4j to write logs in real-time to Elasticsearch. 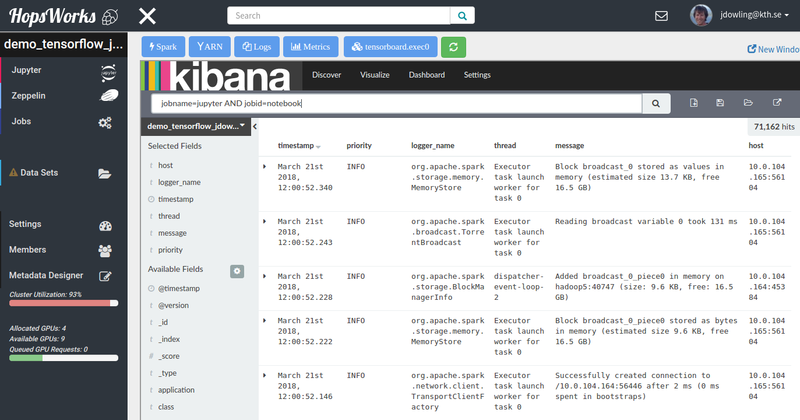 These logs can be viewed in real-time with Kibana from the Jobs UI. Hopsworks also makes the complete application logs available in a Logs dataset, but they are only available after the Job has completed. Spark Jobs provide a metrics.properties file to write performance statistics to InfluxDB, and those logs can be viewed in real-time with Grafana from the Jobs UI. This information is useful for performance debugging of Spark apps. Each project in Hopsworks can have its own Apache Hive database, by enabling the Hive service for that project. By default, only members of the project can read/write from the Hive database. Hive databases can also be shared with other Projects, similar to how datasets are shared between Projects. Hopsworks supports both Hive-on-Tez and Hive/LLAP. 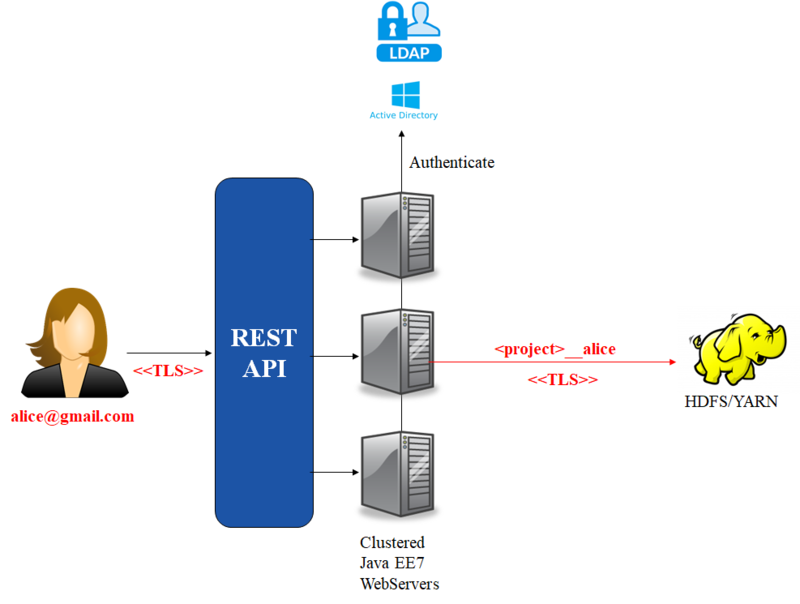 Kerberos and LDAP are supported through authentication realms in Hopsworks. When a user starts a Jupyter notebook server, she decides how many executors (how many CPUs/memory per executor) and how many GPUs they want. The notebook will acquire those resources when it is run. Hopsworks supports Jupyter Notebooks, where each projectUser can launch his/her own Jupyter Notebook server. Jupyter notebooks are stored, by default, in the “Jupyter” dataset in HopsFS, but notebooks can be opened from any dataset within the Project. We support the sparkmagic Jupyter kernel, which we use to run both Spark and TensorFlow applications (Flink is not supported by Jupyter). Hopsworks supports Zeppelin as a Notebook. There is a single Zeppelin Server for Hopsworks, and each project can start its own interpreter. Interpreters are shared between all users in a project, making Zeppelin suitable for collaborative work on notebooks between different users. Zeppelin notebooks are stored in HopsFS and available from the “Notebooks” dataset. Zeppelin on Hopsworks support Spark-Livy/Hops/Flink interpreters for running jobs. Hopsworks provides a REST API for authentication, running Spark jobs, producing to Kafka topics, training and deploying TensorFlow applications, and performing all the functions that are available in the Hopsworks User Interface. This enables Hopsworks to be an embedded platform, that is included as a component in other systems – truly, Big-Data-and-AI-as-a-Service. External clients can download either a certificate for accessing the REST API or access it using JWT tokens. All communication with the REST API is encrypted over TLS/SSL connections. Hopsworks also has a library for Android devices, allowing them to seamless produce data in real-time to Kafka and call inferencing functions on trained TensorFlow models. In Hopsworks, extended metadata is built-in to the platform.The Hopsworks UI supports free-text search for data assets using Elasticsearch. Hopsworks also provides a metadata designer tool to design or import a schema with which to describe data assets. 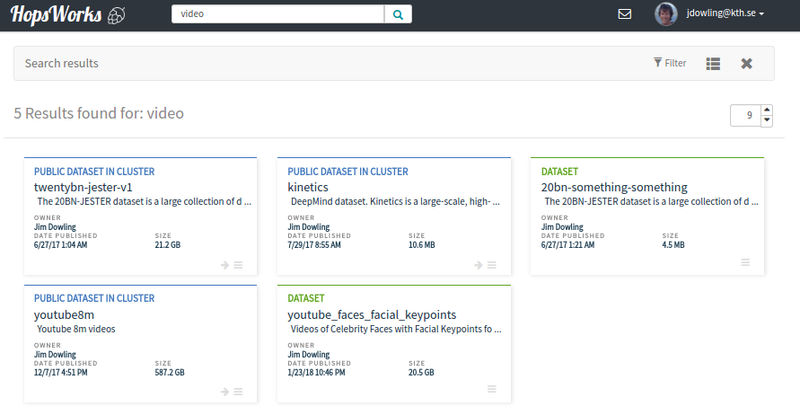 Non-technical users can then curate data through our user interface, while the extended metadata is automatically exported to Elasticsearch (using our own ePipe system). 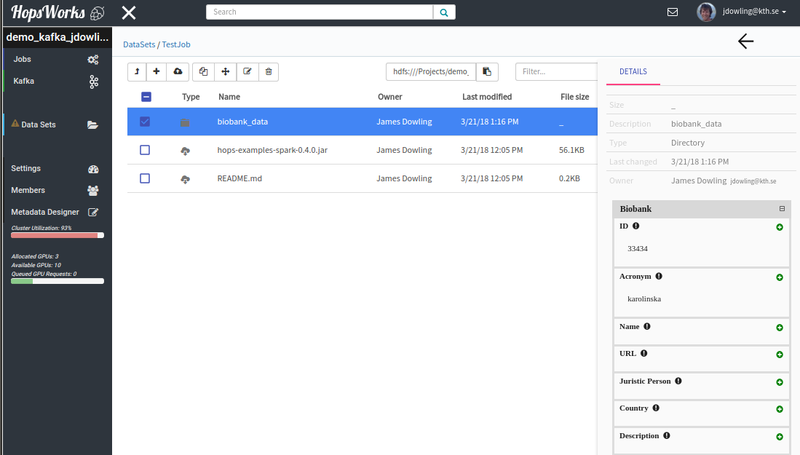 For users, Hopsworks provides a simple unified interface for managing data assets. Hopsworks also has built-in auditing capabilities, supported by the default open-source web application server shipped with Hopsworks, Payara. Metadata schemas can be designed with an intuitive UI. Metadata can be added to data assets from the UI by attaching metadata schemas to them and editing the metadata in the UI. The data asset can then be discovered using free-text search (using an Elasticsearch backend). Free-text search for data assets is supported. Public datasets are discoverable from the landing page, but search within a project can be used to discover data assets only within the scope of that Project. 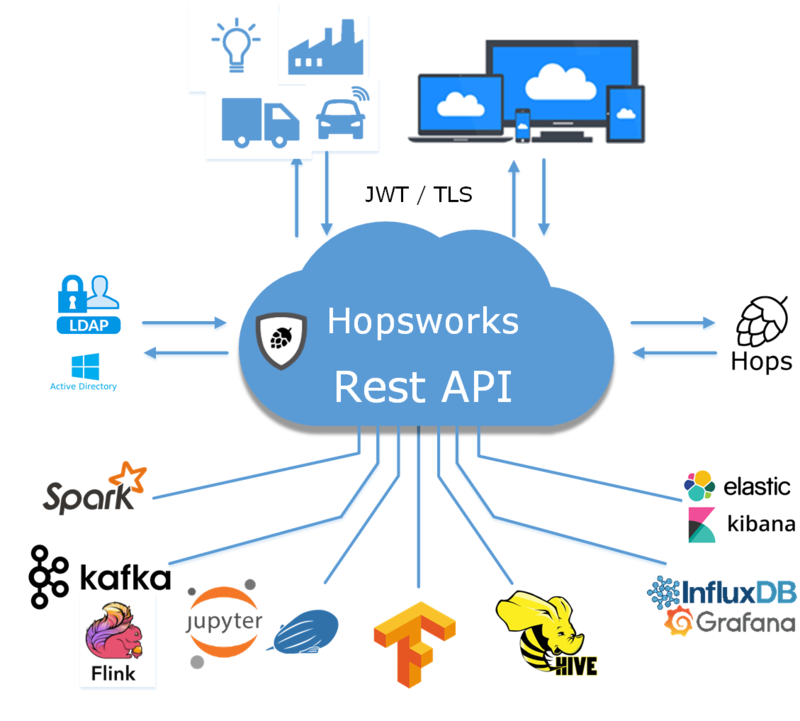 Hopsworks is a new data platform that makes working with large-scale data processing platforms easier for both humans, via an integrated UI, and external devices and applications, via an integrated REST API. Hopsworks is built on the new abstractions of Projects, ProjectUsers, and Datasets and it is enabled by a new distributed metadata architecture in Hops Hadoop. Hopsworks: Improving User Experience and Development on Hadoop with Scalable, Strongly Consistent Metadata, Ismail et al, ICDCS 2017.